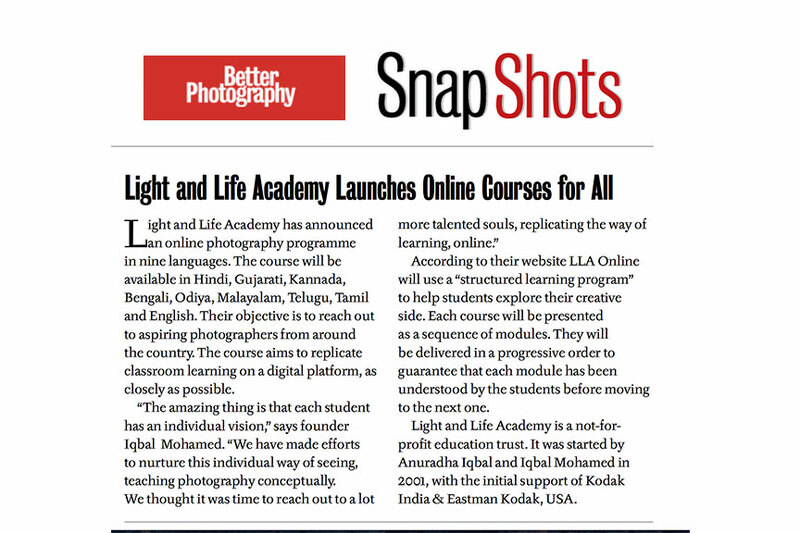 Light and Life Academy has announced an online photography course in nine languages. The course will be available in Hindi, Gujarati, Kannada, Bengali, Odiya, Malayalam, Telugu, Tamil and English. Their objective is to reach out to aspiring photographers from around the country. The course aims to replicate classroom learning on a digital platform, as closely as possible. According to their website LLA Online will use a “structured learning program” to help students explore their creative side. Each course will be presented as a sequence of modules. They will be delivered in a progressive order to guarantee that each module has been understood by the students before moving to the next one. Light and Life Academy is a not-for-profit education trust. It was started by Anuradha Iqbal and Iqbal Mohamed in 2001, with the initial support of Kodak India & Eastman Kodak, USA. This entry was posted in New and Events on January 25, 2018 by .